Soon after Luther Allison's first recordings in 1967 and his first album release on the Delmark label in 1969, Luther Allison inked a deal with Motown's Gordy label which produced three albums in near record time. 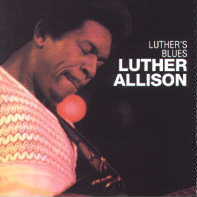 This reissue under the aegis of the UME series Blues Classic brings back that second release dating back to 1974; Luther's Blues. Besides helping to define Allison as one of the major West Side guitarists, and enlightening all to his takeover of Freddie King's band, these seventies issues shaped the artist Allison who we only welcomed upon his return from France in the early 1990's. Behind Luther's guitar and vocals are drummers K.J. Knight and Andrew Smith, and bassists Bob Babbitt and Gary Beam. Keyboards are handled by Paul White with Tom Curry subbing on one track. Ray Goodman and Gene Block provide the second guitars, and these sessions were recorded at Motown Studios in Detroit (with the exception of the closing number). The opening title track scorcher was apparently a holdout from the previous album Bad News Is Coming. Following with two cuts previously done in the 60s by Sammy Ward: "Someday Pretty Baby" and "Part Time Love"; Luther punches out clever redux. Along with Willie Dixon's "Easy Baby," his own "Now You Got It," "K.T.," "Let's Have A Little Talk," "Into My Life," and Roosevelt Sykes "Driving Wheel," the original vinyl is covered, remastered, and restored. The added bonus on this disc are three previously unreleased cuts: including five-minute versions of Freddie King's "San-Ho-Zay" and "Bloomington Closing-early version." The final live cut comes from Luther finale at the 1973 Ann Arbor Blues Festival; and it is a medley of "I'm Gonna Miss My Baby," "Bad News Is Coming," and "The Thrill Is Gone." Luther freaks can rejoice with this reissue and the three long lost tracks coming to light. This is good news for any blues fans because this is Luther in his prime; vibrant, wildly proactive, and cleverly innovative throughout. This review is copyright © 2001 by Mark A. Cole, and Blues On Stage, all rights reserved. Copy, duplication or download prohibited without written permission. For permission to use this review please send an E-mail to Ray Stiles.